This market leading text is known for its comprehensive coverage, careful and correct mathematics, outstanding exercises and self contained subject matter parts for maximum flexibility. 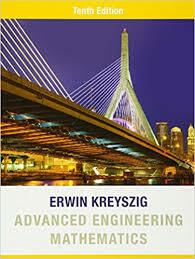 The new edition continues with the tradition of providing instructors and students with a comprehensive and up-to-date resource for teaching and learning engineering mathematics, that is, applied mathematics for engineers and physicists, mathematicians and computer scientists, as well as members of other disciplines. G. Probability, Statistics in Chapters 24 and 25. This is shown in a block diagram on the next page. The parts of the book are kept independent. In addition, individual chapters are kept as independent as possible. (If so needed, any prerequisites to the level of individual sections of prior chapters are clearly stated at the opening of each chapter.) We give the instructor maximum flexibility in selecting the material and tailoring it to his or her need. The book has helped to pave the way for the present development of engineering mathematics. This new edition will prepare the student for the current tasks and the future by a modern approach to the areas listed above. We provide the material and learning tools for the students to get a good foundation of engineering mathematics that will help them in their careers and in further studies.